The international price of gold fell 1.41 percent on Friday, to trade at its lowest level since February 2010. MOSCOW (Sputnik) — On Friday morning, the price of gold hit a low of $1,074 an ounce and is currently trading at about $1,080. Since mid-January, the price of gold has fallen by 12 percent, stabilizing at around $1,100 an ounce, but, at the start of the week, the price of the metal tumbled down, showing its biggest drop since 2013. Prices fell on expectations that the US Federal Reserve System would soon announce an increase in interest rates. Last week, Federal Reserve Chairwoman Janet Yellen confirmed a rate raise in 2015 conditional to the favorable development of the US economy. Amid the slump, holdings of the world's biggest gold-backed exchange-traded fund (ETF), the SPDR Gold Trust, fell consecutively on Thursday to 684.6 tonnes, the lowest since September 2008. Some traders associated the price decline with a large gold sale — some five tonnes — on the Shanghai Gold Exchange on Monday. 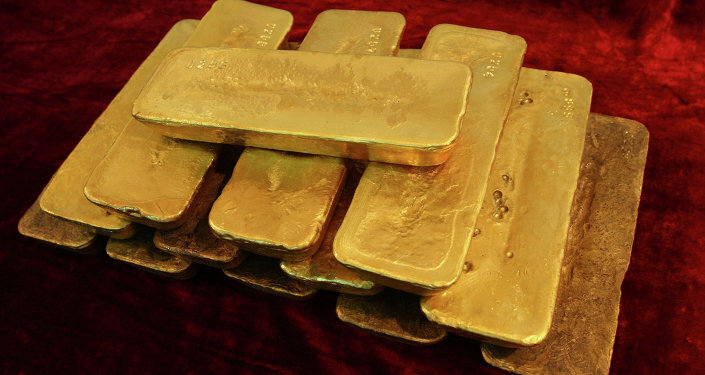 Earlier that day, China's official gold reserves reportedly rose by almost 60 percent over the past six years, according to the People's Bank of China.